Two types of crash a likely to occur on corners when riding a motorbike: the lowside and highside crash. 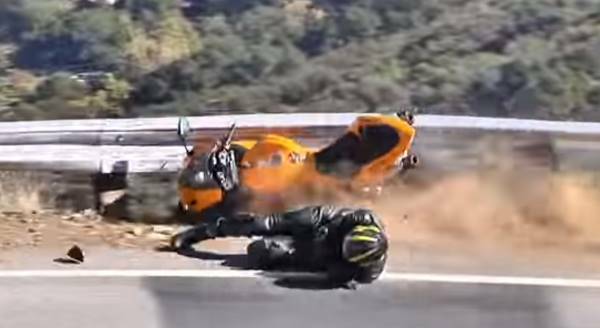 The highside crash is the most dangerous of the two types of crash because the action of the motorbike tends to throw the rider over the handlebars and into the path of the bike. This means that the bike can hit the rider – basically a 250kg solid lump travelling at whatever speed you were doing. It’s like being hit by two Richie McCaws. Made of metal. A highside crash most often starts with the rider accelerating too hard either in a turn or on the exit to a turn, although it can also be the result of speed wobbles. You can see how the rider is thrown into the air and this is why highside crashes tend to have a higher incidence of broken bones. It can cause a rider’s limbs to strike parts of the motorbike, for example the handlebars, causing bruising and broken bones. It is possible to save a highside, but you have to be lucky rather than skillful. Rider applies too much front brake while turning, locking the front wheel while the bike is leaning over. The road surface changes mid-corner (e.g. loose stones, dust or other slippery surfaces) and what was once a safe speed becomes too fast for the road surface. Lowside crashes are more likely on downhill corners and adverse camber corners (where the camber falls away from the corner) because you have gravity working against you. Low-speed lowside crashes are survivable with the right safety gear as the rider will simply follow the motorbike off the edge of the road. If speeds are higher, whatever is on the side of the road will arrest the rider’s and bike’s progress and at high speeds this will cause serious injuries or death. As you can see, the rider was going quite slow, but it would have still hurt hitting that guard rail.